In 1980, Judas Priest set the hard rock world on fire with their release of British Steel. I say hard rock because the phrase "heavy metal" was not yet widely known in the music industry. Judas Priest helped establish the term "heavy metal" with British Steel. 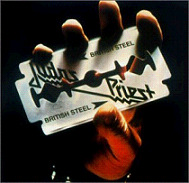 While Judas Priest hit the big time with their metal classic Screaming For Vengeance, which enabled them to begin selling out 20,000 seat arenas across the US, it is the highly influential British Steel that is widely used as a barometer for the future releases of the Priest and other metal bands alike. I began listening to Judas Priest in 1979, soon after I saw them open for Kiss. At that show, their sound system was not the greatest, which I attributed to Kiss not wanting to be upstaged by the Priest. Either way, I came away with a fairly good impression of the soon to be metal gods. It was when a friend lent me a copy of Hell Bent For Leather that I was immediately hooked. I soon added Live - Unleashed In The East to my collection. After that, I stopped listening to Kiss altogether, as they were now starting to get bad press to go along with their very mediocre studio releases, and devoted my full attention to Judas Priest. My anticipation of their next studio release was immense. When British Steel came out in 1980, what a pleasant surprise it was!!! The best way to describe British Steel was that it showcased all of the best qualities of Judas Priest. It showed that they had great potential star appeal with airplay of "Breaking The Law", "United "(in the UK), and" Living After Midnight". Up until British Steel, Judas Priest did not get a lot of airplay in the US. It showed that Judas Priest had the capability of breaking ground and helping to create a new genre of music called heavy metal, which many other bands would soon follow. Lastly, it helped set the standard by which many metal songs are written, with metal classics such as "Rapid Fire"," Metal Gods", "Grinder", and again, "Living After Midnight". British Steel starts off with "Breaking The Law", which shows Judas Priest's more tongue in cheek side. It is one of those songs that is very easy to remember with its simple chorus of "Breaking The Law, Breaking The Law", repeated several times over throughout the song. It also has the distinction of being one of the very first songs filmed for MTV, and set to live action scenery. I crack up every time I see Rob Halford, Glenn Tipton, KK Downing, Ian Hill, and Dave Holland storm into a bank and cause total disruption simply by singing "Breaking The Law, Breaking The Law" right in the faces of the bank patrons, causing terror in their eyes. "Breaking The Law" is one of their most recognizable songs in concert, and is still on pretty much all of Judas Priest's setlists. "Rapid Fire" is one song that broke the mold in the typical song format of verse, chorus, verse, chorus, guitar solo, then either verse or chorus until the song ends. "Rapid Fire" is just that, as Rob Halford just keeps firing away line by line without any chorus. Tim "Ripper" Owens would add a chorus to "Rapid Fire" years later when Priest brought the song back for concerts. The only break in the original song are a few solos traded back and forth between Glenn Tipton and KK Downing, both lead guitarists by design, an early innovation by the Priest. This is definitely an all time Priest favorite of mine. In between "Rapid Fire" and "MetalGods", you hear what sounds like metal hitting against metal, similar to what Judas Priest might have heard years ago growing up in the industrial city of Birmingham, England. After that, another all time Priest fan favorite begins in the form of "MetalGods". This song is an appropriate name for a Priest song, as Judas Priest soon became known as the Metal Gods themselves. This tune still gets played at every Priest show, usually towards the beginning. It has a very recognizable heavy chug and gallop throughout the song. Next up is "Grinder". This is also an occasional concert favorite of the Priest. The nice thing about this song is that there is a tempo change midway through, then goes back to the standard riffs of "Grinder". Next up is "United". I'll never forget that when British Steel first came out, a local Long Island, NY radio station played "United". I taped it off of the radio, and brought an old shoebox tape recorder to the beach one day. I played this song over and over, and then some older teenage girl looked over at me and said, "Who is that group you are listening to?" Anyway, "United" demonstrated Judas Priest's vocal harmony ability, something that they don't use too often. "Living After Midnight" not only demonstrates more vocal harmony ability, but that Judas Priest can rock and roll with the best of them. This is probably the closest Judas Priest ever came to writing an arena rock anthem. "Living After Midnight" was the first Priest song to get extensive airplay on FM rock stations in the US, and is still considered a classic rock standard to this day. It can also still be heard at baseball stadiums in between batters, and hockey arenas during stoppages of play. "Don't Have To Be Old To Be Wise" may well have been Judas Priest's early attempt for a hit song with its catchy title and chorus. "Living After Midnight" ended up filling that role. During the British Steel tour, Priest played this song, and first began encouraging the crowd to sing along with "Don't Have To Be Old To Be Wise". This is a good song, but probably one of the few weaker moments on an otherwise very energetic CD. Judas Priest does not usually open songs with bass lines, however, "The Rage" is an exception. "The Rage" picks up where "Living After Midnight" left off, with it's raw energy, power, and great leads traded back and forth between Glenn Tipton and KK Downing. "Steeler" rounds out the 9- song British Steel album with more raw, in your face, energetic heavy metal. The song and album end on a very high note, complete with leads and a one and a half minute heavy metal jam session. In closing, if you are a classic metal fan, and do not have British Steel currently in your CD collection, for shame. Put down that remote control, PC, game controller, or iPod, make a bee line to your nearest music CD store, and pick up a copy of one of the greatest examples of classic heavy metal power & energy, Judas Priest's British Steel.